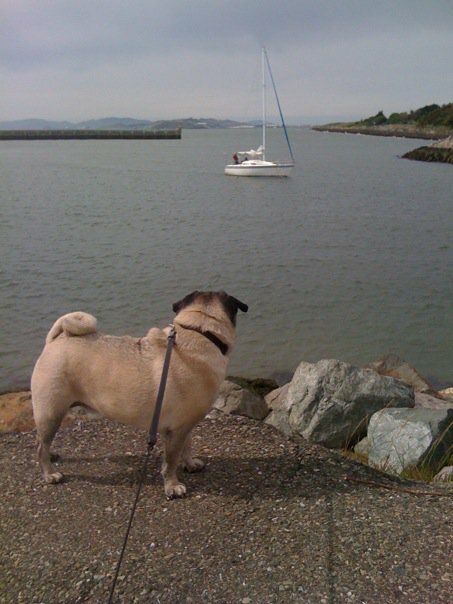 My favorite dog looking at the north entrance of the Berkeley marina. 13 users responded in " I’d rather be … "
Beautiful photo–I miss living by the ocean (the Bay counts to me). And your dog is ridiculously cute. My husband won’t agree to a pet, sadly (I could just get one anyway, but I’m looking for consensus;) . . . the closest thing I have is my sourdough starter. I need to figure out how to soften him up. I’m feeling all nostalgic for California now. . . I started with fish (which kept floating to the top each time we went away)and he eventually gave into something furry. Helps that the boy was my mothers and Jacob had already been around him and Mom was willing to part with the boy. I love that you included the dog in the picture. I didn’t grow up with a dog, but my girlfriend insisted we get one. I was neutral to the idea, but now the dog makes me happier than anything else I have. Taking the dog with on hiking and camping trips has made me realize just how little it takes for me to be content. If you have got a cold Killian’s Irish Red in your hand, then it don’t get no better than that photo!!!! “What, me work?” You must be outta ya gourd!!! Using your guidelines, to get my sailboat in gear, for less money than ever before. DW–thanks! I was actually trying to think of an appropriate way to ask Jacob how you talked him into a puppy! Hah! My lab would be in that water before I put the car in park. Looks like the sailboat we had when I was young and our dog Frank. I can see myself there!!!! Jacob, this is getting scary! Early retirement, same viewpoints on money and life, INTJ, dreams of sailing the world (except for DW), and now also owns a puggle. I’m freaked out enough to post. @Kevin M – I have a lab myself. And I totally agree with what you said. I don’t think I can get this kind of a picture with him. LOL! Hey I have a pug too! =) Pug lovers unite! Pug Owner here. Also on the quest to ‘retire’ early. Great blog! And I am with HSpencer. You gotta have a Killian’s in your hand!